We have many clients who are interested in our SEO (search engine optimization) services because they want to show up on the top of Google search results. Once we start working with a business on improving their organic search traffic, at some point, we eventually get the question "So, are we on the first page of Google yet?". Unfortunately, a simple "Yes" or "No answer is not accurate, because there are many qualifying factors to this question. A webpage could show up on the first page of Google results for one set of keywords but not for another, or it could show up on the first page when you’re searching on your cell phone, but not when you’re on a laptop. Or one of the website’s article page could show up on the first page, but not their home page. This is the reason for this article - the goal is not to make a business owner become an expert in SEO (after all, that's our job). The goal of this article to help a business owner better understand the SEO process, and learn some of the key things to remember when thinking about SEO. Website – Build an intuitive website that has good infrastructure and architecture. One way to think about SEO is that it’s like a jigsaw puzzle made up of hundreds of pieces. While some pieces are more important than others and requires special care and attention, you need to have all the pieces working together to form a complete picture. This means for your website to show on the first page of Google, it's not just about your website or just about creating content or backlinks – it's a combination of all of them. It is true that there a many moving parts to SEO, and for those interested in learning more about SEO themselves, one good resource is Moz's The Beginner's Guide to SEO. 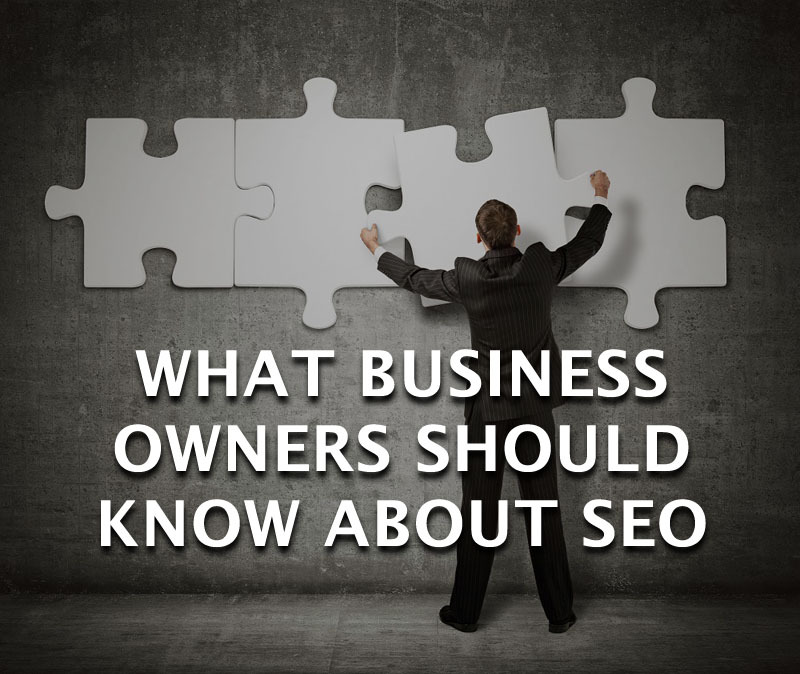 But for busy business owners, here are a few key things worth remembering about SEO. The amount of work that needs to be done for your website to show up on the first page of Google differs for each business. Everyone wants to be on the first page of Google, including your competitors. Since your competitor is in the same business as you, you are both going after the same keywords & content that your prospects will be searching for. If your competitors are proactively doing SEO work on their business, you would have to work extra hard (or more effectively) to show up above them. Alternatively,you can also find a niche in your business, something that makes you different than your competitors but something that is also in demand. Many business owners think that once their website shows up on the first page of Google, that the work is done. Unfortunately, the algorithms that determine the fate of your website’s position in the search results is constantly changing. Your competitors are also most likely making continuous improvements to their digital presence. So even if you are already on the first page, don’t think you can take a breather from SEO or you may find that your competitors suddenly outrank you on organic search results. Each time someone types keywords into a search engine, the results are unique and personalized. What Customer A sees is not necessarily what Customer B will see. Search engines uses many other information, like previous searches, sites visited, device used, location, etc. and displays what they deem the most relevant to the search query entered. This is especially true for local businesses, i.e. businesses that serve their local community. 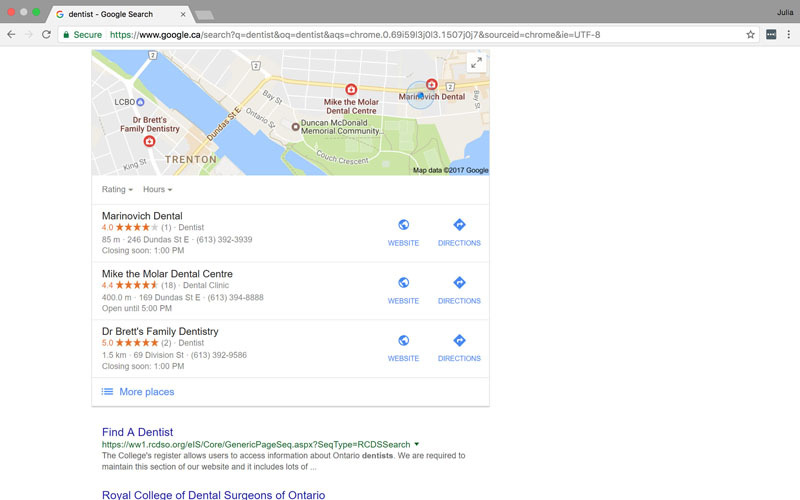 For example, if you have a dental practice in Quinte, a prospect located in Mississauga searching for "dentist office" will not necessarily see your business in his or her search results. Organic search results are also different for each keyword or phrase. Your business may be on the first page for some keywords and might be on the latter pages for others. 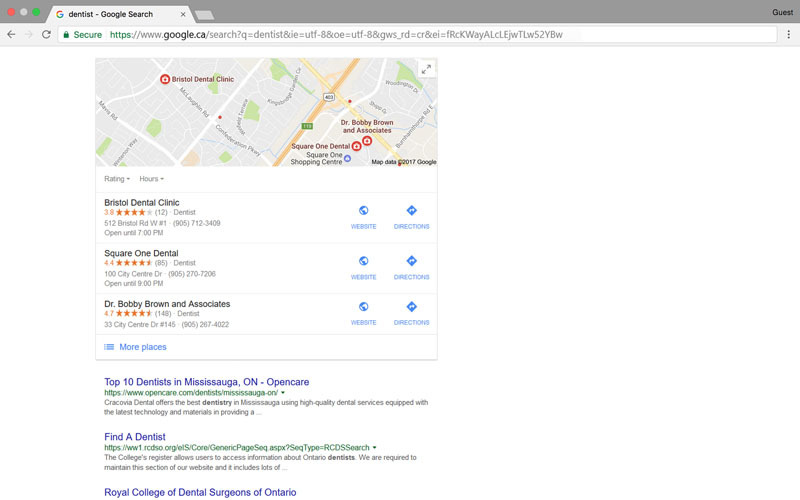 Your website may show up on the first page for "dental office in Mississauga" but they may not show up when people type "best dentist in Mississauga". Your prospects may also type "need dentist for my toothache" or "looking for dentist for my kids". Business owners should be aware of how prospects are searching for their business so that SEO work can be done for the different search keywords/phrases. SEO companies cannot guarantee first page placements for your website since the algorithms keep changing and search engines do not publish the secret sauce. There are third-party companies that do some ranking correlation studies for the different factors impacting search results, and SEO companies use this information as guidelines to keep your website and content fresh, relevant and optimized for searches. Just because you show up on the top of search results doesn't mean you will get leads. One reason is that a competitor's paid search ads are still shown above organic results, so especially on mobile devices, searches may not see the first organic listing until they scroll down past the ads. Don't focus on being top of search results. Instead, focus on the business goal, which for many businesses is to increase sales and revenue. Our advice is to look at your marketing efforts as a whole, as there could be other more effective ways of getting more business, such as email marketing or referrals. Don't game the system, nor work with SEO companies that do. All the effort that goes towards getting you to the first page could be neutralized when the algorithm gets updated, or worse, Google could penalize your site and drop you from search results. Create content that is helpful to your prospects. After all, even if you are on the first page but your content is not useful, your prospects will not be clicking on your link in the future. Work with an SEO company that stay on top of algorithm changes, SEO trends and who will constantly apply modifications to the SEO efforts based on insights from analytical reports. Interested in getting a company to work on your website's SEO? Check out a video published by Google Webmasters on "How to Hire an SEO Consultant". And of course, we'd be happy to set up a free consultation and provide you with our recommendations on what you can do to improve your visibility on search engines. Contact us at [email protected]. What Is The Difference Between Paid Vs Organic Search Traffic?